This awe inspiring region of British Columbia offers visitors access to the rugged Coastal Mountains and the Fraser River and its many tributaries, including the Thompson, which makes its way through narrow canyons and vast valley floors to the Pacific Ocean. From Hope to Spences Bridge the TransCanada Highway (Hwy 1) follows the Fraser and Thompson Rivers into the interior of the province. Vegetation includes salal, devil's club, fern and maple, hemlock, balsam, fir and alder. The highway between Yale and Boston Bar includes seven tunnels and impressive views of the canyon. The highway and two railroads have been cut into the side of the mountains far above the raging Fraser River. This drier, extreme climate's vegetation includes sagebrush and tumbleweeds and the trees become considerably sparser. 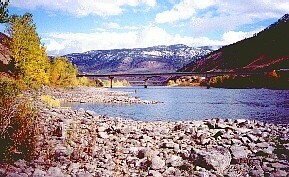 Continuing north along the TransCanada Highway, visitors will follow the brown waters of the Fraser until it joins the clear waters of the Thompson River at Lytton. The surrounding area is dry with little vegetation apart from bursts of green irrigated farmland. This is the 'dry belt' region of BC. 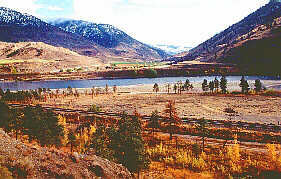 These two rivers which help to form the Fraser and Thompson Canyons are world renowned fishing and whitewater rafting locations. Numerous guides and outfitters are located in the area and can provide visitors with an opportunity to shoot the rapids or fish for the Fraser's Pacific Salmon that migrate to their birth place in the interior every four years or the steelhead in the Thompson River.